Welcome to the online gallery of unique, custom designed jewelry from the collections of Kim Maitland and numerous other jewelry designers. We have specialized in one-of-a-kind designs since 1978 when we began Creative Metalsmiths as one of the only all-metals galleries in the southeast. We have won numerous awards for our metalwork and jewelry designs since that time. The aim of our gallery is to promote unique metalwork with the artists who create it in a fashion that encourages collectors and a clientele who are interested in production, limited edition and one-of-a -kind pieces. We provide one or two individual or group exhibitions each year to promote unique metalsmithing to our public in the Research Triangle area of North Carolina. Please see our show calendar page for dates of exhibitions. At Creative Metalsmiths we work both with stones and all metal designs, specializing in wedding and engagement rings as well as in custom design and one-of-a-kind. We also have an inventory of mokume wedding bands on hand. All our work is hand fabricated; no casting is involved. Please contact us concerning current inventory and custom orders. Also available upon request we can post photographs of pieces on hand that you may be interested in that are not already in the online gallery. Creative Metalsmiths is proud to be a member of the North Carolina Society of Goldsmiths, Piedmont Craftsmen’s Guild, American Craft Council, and the Carolina Designer Craftsmen’s Guild. 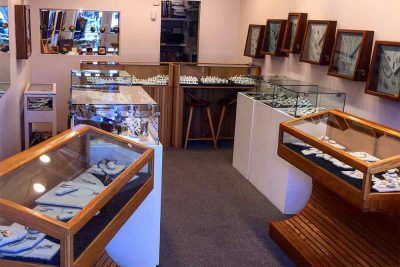 We Invite you to stop by our store to see our complete line of finished pieces, wedding bands, including mokume wedding bands, wedding and engagement ring sets, and our collection of loose gem stones that are available.